Over the top, Erik! Nice personalization, too! I like this setup, how much did it cost to do? I have not tried cutting aluminum because I am still trying to get a handle on the wood situation. It seems I have serious leveling issues so I wanted to lift and add t slots with a spoilboard I could surface. I was concerned about possibly taking away some strength by lifting it but this seems like a much better plan. It was $23 for the aluminum from ebay and 2 makerslides from Inventables...but you could use any aluminum extrusions. The supports are attached to both makerslide and also the extrusion under the wasteboard, so it is much more rigid. Would you be interested in making me a set or sharing the plans if I want to attempt wasting the aluminum (not sure if I am at that level yet) lol. How much extra height does yours add? I hear ya there, I have been learning vcarve for a couple weeks now and should be able to take that file and send it through easel I just need to know the magic feeds and speeds and what bit I should use or get. Also is there a specific type of aluminum or is aluminum all the same? 1/4" aluminum? I want to start out saying, I am by no means an expert at cutting aluminum...I have had good success and I will share what I have been able to figure out. Is it the best or the cheapest? Who knows, but it has worked well for me. There are better bits, but I tried these first since they were cheap and I was just testing things out and they work well for me. The endplates I made add a full 2 inches to the makerslide height. 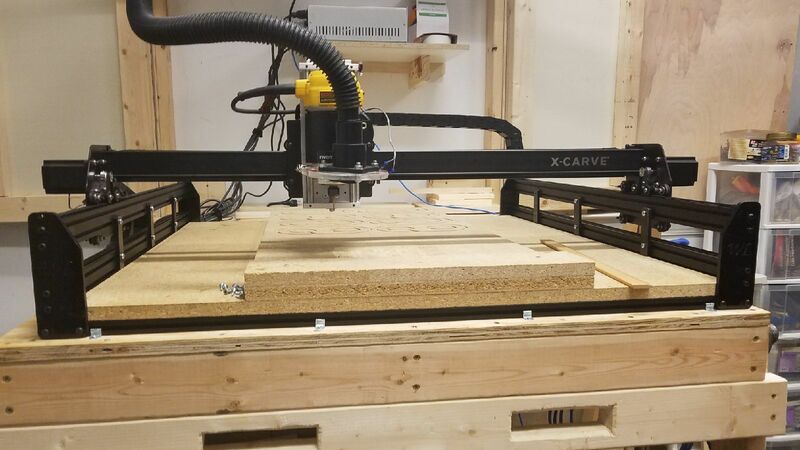 So a raised wasteboard or a new z-axis will be required after installing these plates. The dxf file is in mm, so if you import them into a vectric product, make sure you start with a metric design so they are imported at the correct size. You will notice the outside profile is setup with two concentric vectors. I did that so I could cut it as a pocket instead of a straight profile cut so the bit would have an easier time clearing out the chips and make cutting more reliable. I used the 1/8" bit for the entire operation...I cut the last set I made at 60 IPM with a 7% stepover and a 0.05" depth of cut. I ramped in the cuts so I used a plunge of 50 IPM...If your software does not allow ramping in the cuts, use a much slower plunge and a shallower depth of cut. I cut the holes first...put a couple of screws into the holes to hold the parts down and then cut the profile. I used screws to avoid using tabs so cleanup was easier. I know of 6 people that have successfully made these plates...the last one was just the night before last. He used a few shots of WD-40 as it was cutting as lubrication. I v-carved the initials using a 1/8" 90 degree v-bit. Feel free to use your own initials or none at all. Here are the ones cut the other night...painted black and installed. He did a great job on them. He used the exact same bit I used. Practice, learn what the machine can do...when you are ready let me know and I'll talk you through it. I think my problems are mostly getting feeds and speeds right still at this point but this thing needs to start making me some money before I can justify throwing more at it. I might give this a go when I get more comfortable with the machine and have a little bit of extra money to possibly waste. I feel like I should be doing so much more with this machine after having it 2 years but its been mostly trial and error and learning the hard way and more time on the forums than the machine. The forums are great and you can learn a lot, but you need to just dive in and be prepared to waste material. It truly takes time...I wasted lots and lots of wood when I was starting, but the more you use it the better you get. Take good notes when you cut things so when you find what works, you can generally assume it will work again on the same material...pretty soon you will have compiled a list of materials with bit sizes and feedrates that produce the best quality for your machine. It just take time and practice. Ahh.. got it thanks... It says 1/2" depth should be 1/4" aluminum correct? Also how often does it need WD40 just to start or periodically throughout the cut? This seems like a perfect use for the 2 pieces of makerslide I couldn't bring myself to toss after upgrading to the single piece x-axis. I see you've got quite a few other mods going on as well (z-axis slide, look like bigger y-axis motors, etc.) Would you say that there's value in making this change with the stock z-axis or do you really need to improve the z-axis first? 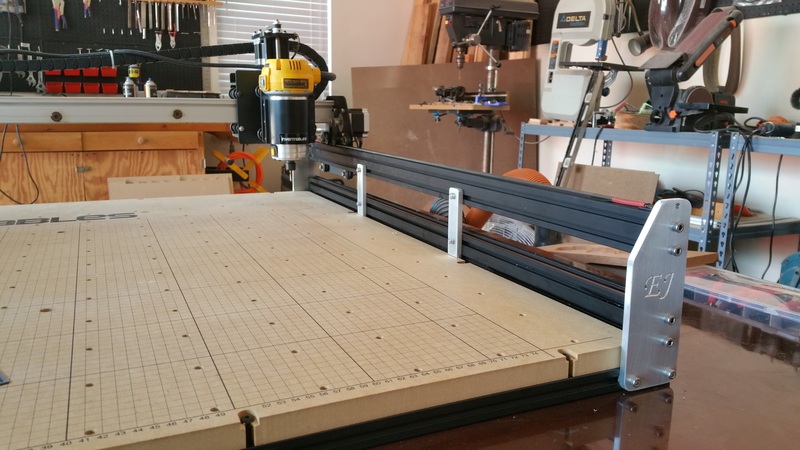 I realize leaving the stock z-axis means that the waste board would have to be raised, but I've been looking at making a vacuum table anyways, so the extra 2" would be nice to be able to work around without getting overly creative designing around the base of the frame. @RyanEdwards - I didn't use any lubrication when I cut mine, he told me he gave it a few shots throughout the cutting process...I don't really know how much as we talked until he started cutting then afterwards when all was done. 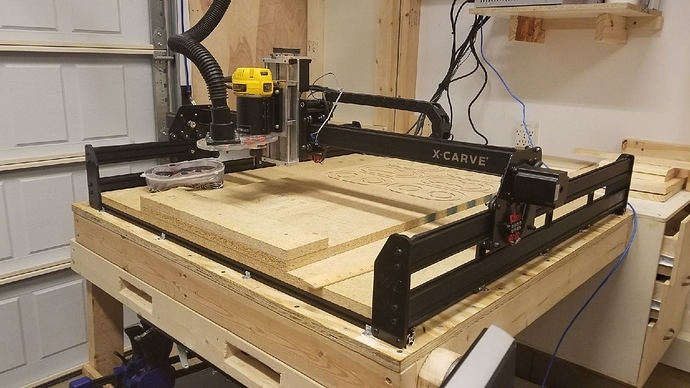 2 - to raise the axis so I could add a rotary axis to my x-carve. Prior to that I had no reason to do new plates.